Florence, Italy. 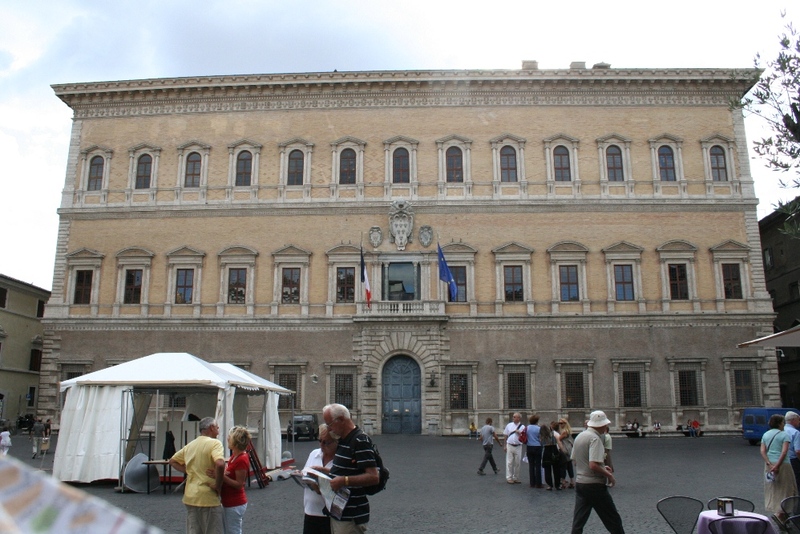 Palazzo (Palace) Medici Riccardi. c.1445-1460, designed by Michelozzo di Bartolomeo. The palace, built for the newly wealthy Medici banking family, is a prototype of Italian Renaissance architecture, featuring rusticated stonework (ashlar) on the lower floors, horizontal string courses providing “neat lines” between the floors, orderly banks of biforate (twin-light) windows, and elaborate cornice overhanging at the roofline. All of these features became prominent features of the Italian Renaissance architecture tradition. For more images of Renaissance architecture on Flickr, Click here. Florence, Italy. 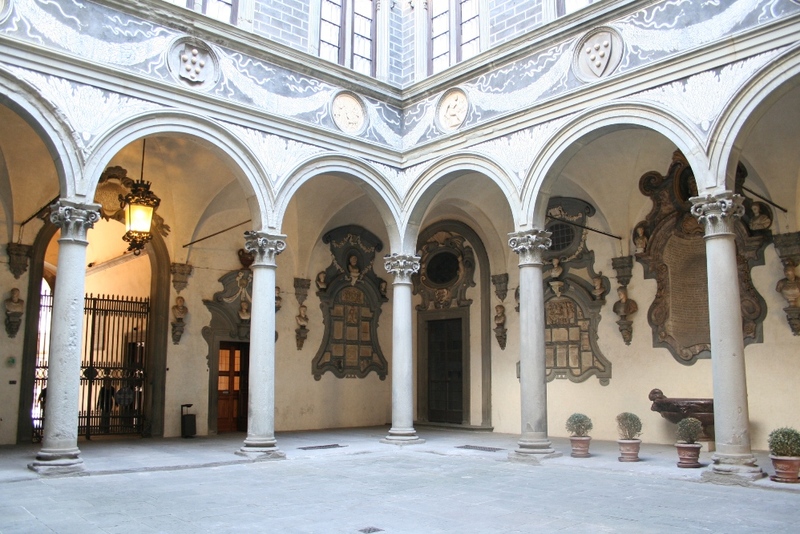 Palazzo Medici Riccardi. 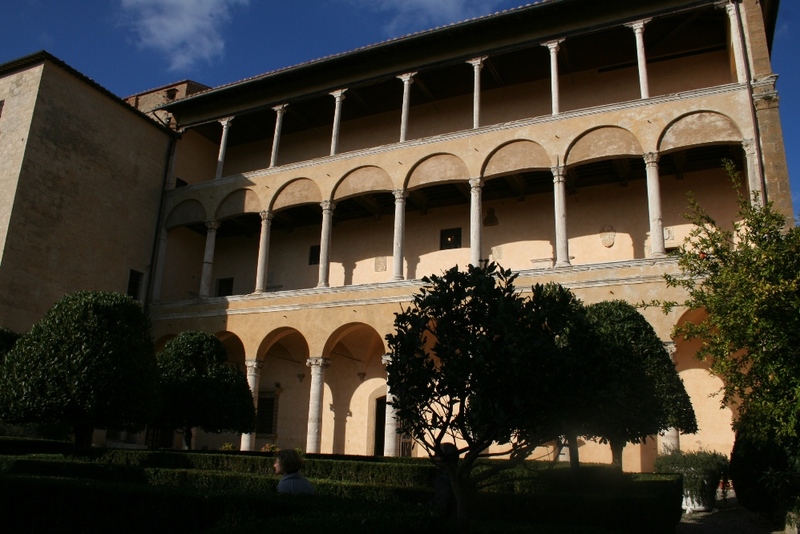 Open colonnaded courtyard at center of the palace, based on the concept of the monastic cloister of medieval times. Renaissance architecture such as this featured simplified geometric shapes and visually lighter architecture that focused on horizontal emphasis, contrasting sharply with the thicker, elaborate, vertical orientation of previous Gothic architecture. Pienza, Italy. Palazzo Piccolomini, an early Renaissance palace designed to provide a view over the garden below (next photo) and valley in the distance. This back side of the palace features three levels of Renaissance-style loggias (open arcades). Pienza, Italy. The Piccolomini gardens, an early Renaissance garden based on formal, symmetrical planning similar to Renaissance architecture. Leon Battista Alberti promoted this formal layout of garden, and its relationship with the villa, itself placed to view the garden from above. 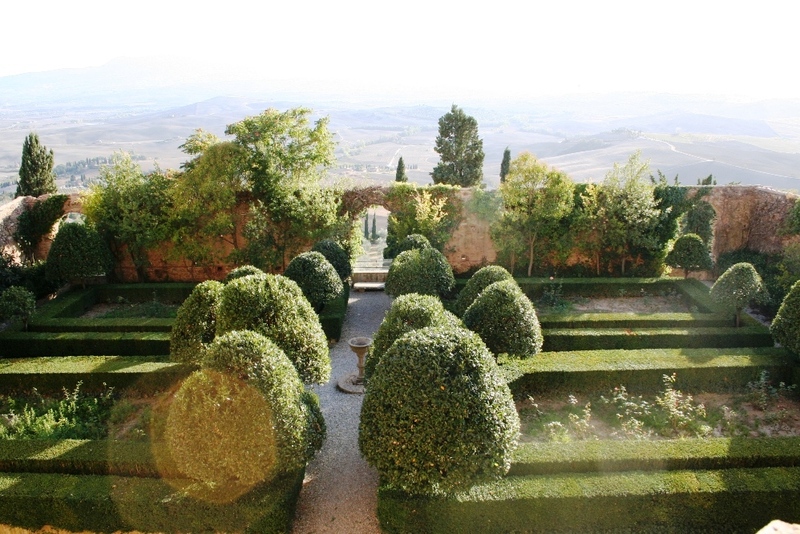 The Piccolomini garden and palace represent this planned garden-villa layout scheme that spread throughout Europe. Brugge, Belgium. 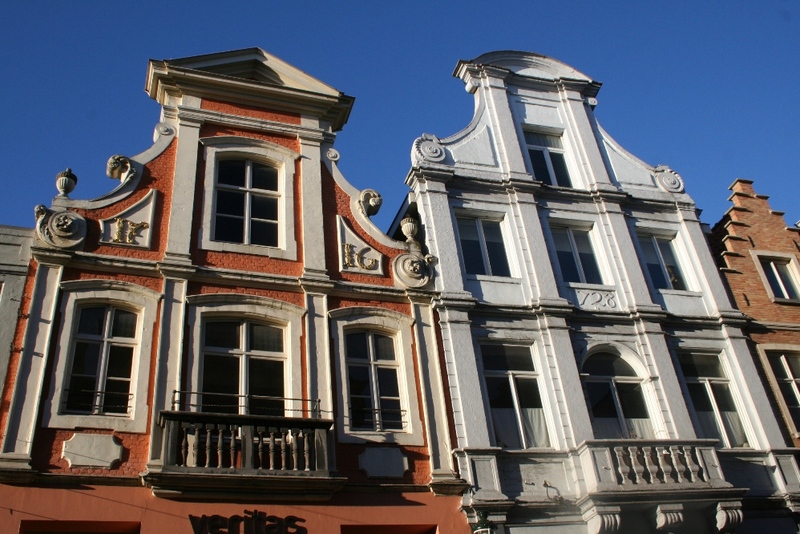 The influence of the Renaissance in the northern European “low” countries of today’s Netherlands and Belgium was revealed most in the decorative gables of townhouses. As a reaction to Catholicism, this Protestant region favored stark simplicity, and the merchant townhouse became the primary outlet for decorative Renaissance architecture, often in the form of stepped or “neck” gables like these. Florence, Italy. 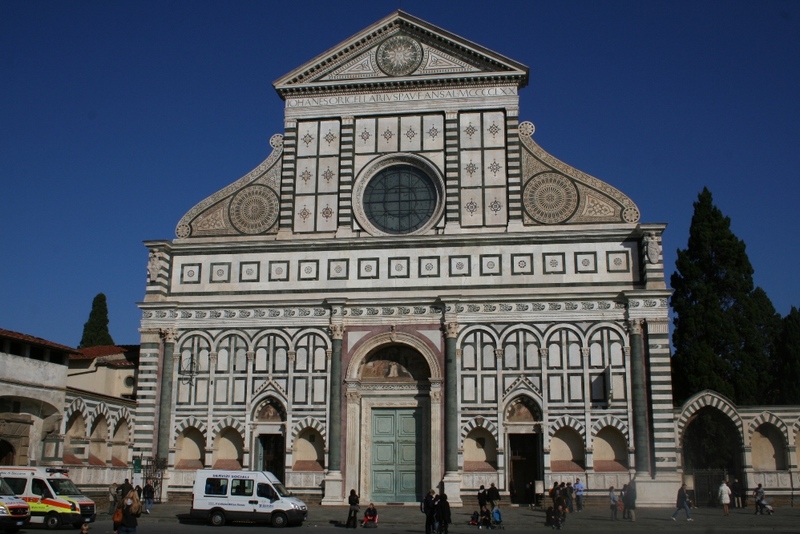 Basilica of Santa Maria Novella. Facade completed by Leon Battista Alberti in 1470. The top half consists of Alberti’s early Renaissance facade, with round window, four pilasters capped by a Greek-style pediment, and flanked by huge S-shaped volutes with scrolls. This is the first-ever use of such scrolls, copied on Renaissance-era churches throughout Italy. This is the prototype. Florence, Italy. Basilica di Santa Maria del Fiori (St. Mary of the Flower), completed 1436 as a Gothic-style cathedral, desgined by Arnolfo di Cambio in the late 1200s. 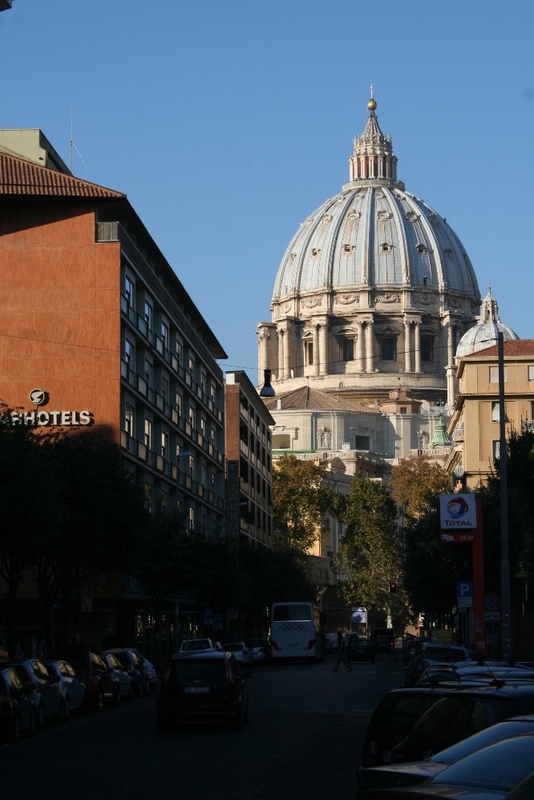 The Renaissance story here involves the largest brick dome in the world, added later by Filippo Brunelleschi and inspired direclty by the Pantheon in Rome. Brunelleschi’s dome is the prototype for countless other Renaissance domes and later versions constructed in North America (e.g. The Capitol Building in Washington, D.C.). Vatican City (Rome), Italy. Dome of St. Peter’s Basilica, the tallest dome in the world. 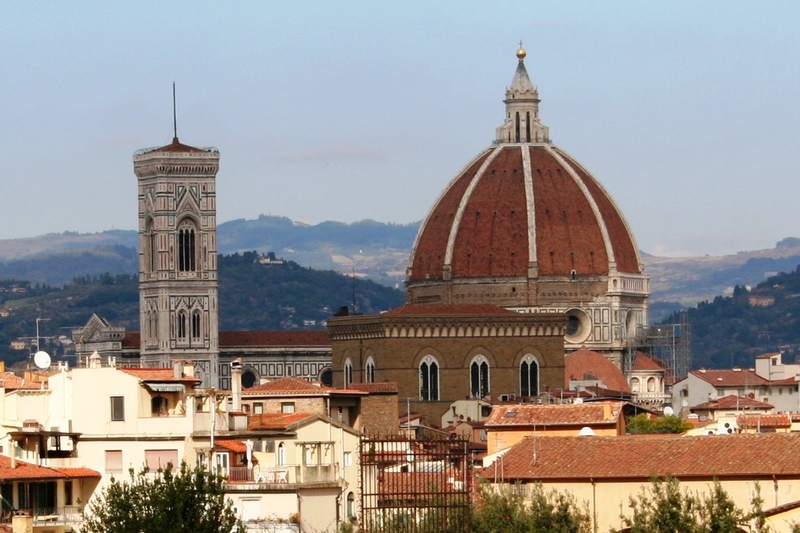 Its architects looked specifically to two earlier domes for inspiration, that of the ancient Pantheon (see the page on Classical Roman architecture), and the Renaissance prototype by Filippo Brunelleschi on the Florence Cathedral. Vatican City (Rome), Italy. 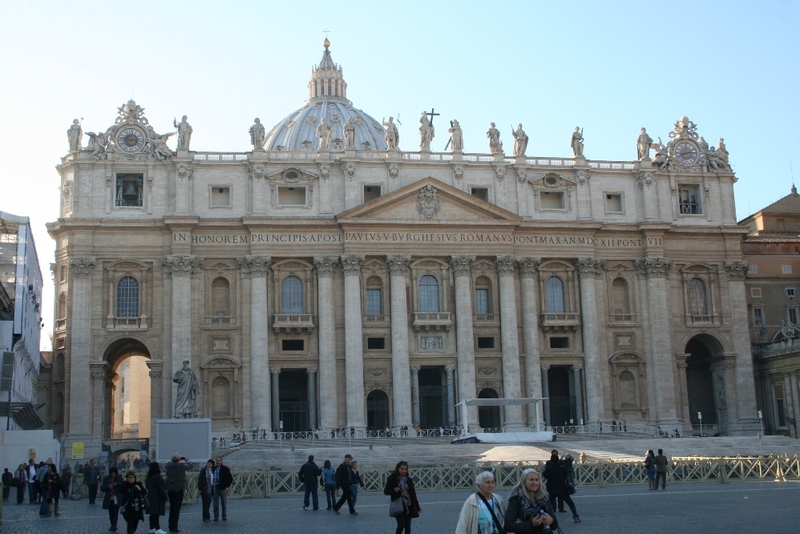 St. Peter’s Basilica, c.1506-1626. Considered one of the grandest (if not the grandest) late Renaissance structures in Europe. Rome, Italy. 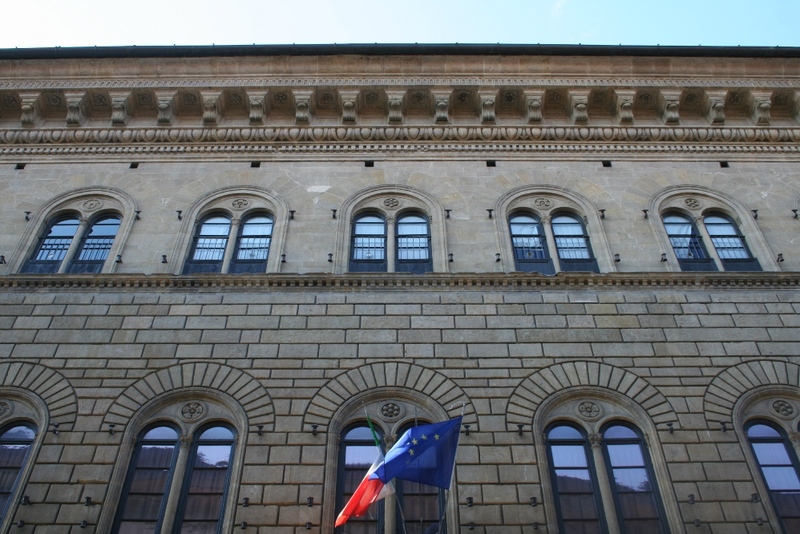 Based on the principles of the Palazzo Medici in Florence (above), this structure demonstrates the full suite of early Renaissance palace architecture, featuring rusticated (rough) stonework on the ground floor, string courses separating the floors, an overhanging cornice, central and heavily arched entryway and decorative pediments above the windows.The entire structure is bilaterally symmetrical, representing the formal orderliness of Renaissance design.